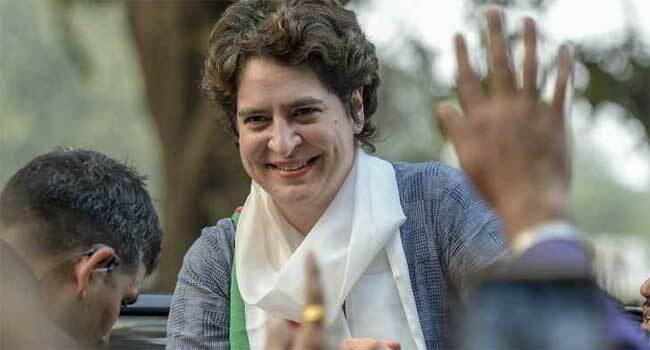 New Delhi, Feb 6 (PTI) Priyanka Gandhi Vadra Wednesday took charge as AICC general secretary and will helm the party''s affairs in Uttar Pradesh East. She arrived at the party headquarters at Akbar Road after dropping her husband at the office of the Enforcement Directorate for questioning in a money laundering case. She also met some party workers and leaders from the Hindi heartland state. During her 15-minute stay at the party office, security personnel had a hard time controlling the crowd that had gathered there. The atmosphere at the AICC headquarters was electric. Priyanka''s official entry into politics is expected to boost the morale of the party workers in Uttar Pradesh, the state which sends 80 MPs to Lok Sabha. A large number of party workers welcomed her by raising slogans of "Priyanka Gandhi aayi hai, nayi roshni layi hai" (Priyanka Gandhi has come, she has brought light). "I am extremely happy to be here," Priyanka told reporters soon after she reached the Congress headquarters. She thanked her brother and Congress president Rahul Gandhi for entrusting her with the responsibility and said people of Uttar Pradesh had given a lot to her family. Rahul and his mother Sonia Gandhi have been elected to the Lok Sabha from Uttar Pradesh''s Amethi and Rae Bareli constituencies. It is speculated that Priyanka might follow in their footsteps by contesting from a seat in the state. Earlier, her father Rajiv Gandhi and grandmother Indira Gandhi were also elected from Uttar Pradesh. While leaving the party office, Priyanka stepped out of her black Land Rover and greeted the Congress workers and supporters waiting outside. She waved to them and shook hands with some. Priyanka, 47, was appointed as general secretary and in-charge of Uttar Pradesh East on January 23 by Rahul Gandhi. She has been allotted an office adjacent to that of her brother''s at the party headquarters. She will share her office with Jyotiraditya Scindia, general secretary in-charge for Uttar Pradesh West. Scindia''s appointment was made on the same day as Priyanka''s and he assumed charge earlier in the day. Priyanka will attend her first official meeting on Thursday. Rahul Gandhi has called for the meeting, which will also be attended by all other party general secretaries and in-charges of various states to plan the strategy for the upcoming Lok Sabha elections.